NDMC Recruitment 2018: New Delhi Municipal Council has issued official notification for 16 vacancies of the Sector Officer. Eligible and skilled candidates can send New Delhi Municipal Council Jobs 2018 application form through offline mode from their official website mcdonline.gov.in. Interested candidates can apply offline for the NDMC Section Officer Vacancy 2018 till the end of 20th October 2018. Candidates can download official notifications from the official website before applying for this vacancy. New Delhi Municipal Council to get more information about recruitment like qualification of eligibility details like educational qualification, age limit, selection process, application fee and how to apply, important links, courses, admission letter, results, last letter below. description. The selected candidates will get salary band-2 Rs 9 300 + grade pay Rs.4200 + variable dA (salary level -6 under 7 th CPC) from the organization. Interested and qualified candidate can download the website from mcdonline.gov.in in prescribed form and send your application on or before 20th October 2018. The prescribed format with photocopy of all relevant documents should be submitted to the address specified below. NDMC Assistant Audit Officer Recruitment Notification 2018: 33 Assistant Audit Officer for the vacancies @ ndmc.gov.in. New Delhi Municipal Council NDMC Assistant Audit Officer is recruiting assistant audit officer through recruitment 2018. Interested and qualified candidates who wish to apply this recruitment, can make offline applications at their official website ndmc.gov.in. The full details of this recruitment are available on their official website and meesevats.in also provides complete information about this notification. Educational qualification, application process instructions are outlined below for implementation. (1) In the accounting department, with the same post as a junior account officer in the section officer or accounting department or with regular service of 03 years. (2) In the same or any other organization / department of the Central Government, the period of deputation in another pre-cadre post immediately held before this appointment before the appointment, the period of deputation. Usually will not be more than three years. Maximum age limit for appointment by Deputation should not exceed 56 years as per the expiry date of the application. Selected candidates will get level 7 of the 7th CCP pay matrix (4,6,600-1,51, 100) from the organization. Interested and qualified candidates can download from the website ndmc.gov.in in prescribed form and send their application on or before 22/10/2018. The prescribed format with photocopy of all relevant documents should be submitted to the address specified below. NDMC Recruitment 2018 – 21 Senior Resident Posts launched notification for the recruitment of the posts of 21 Senior Resident under NDMC Recruitment. All Eligible and Interested candidates may additionally apply Online mode earlier than the Last Date i.E., eleven-04-2018. Different Details Like training qualification, age restrict, selection technique, utility fee & how to apply, important hyperlinks, syllabus, admit cards, consequences, preceding papers . Candidates must have doneMBBS with PG Degree MD/MS/DNB/Diploma or its equal qualification from a recognized college. Rs. 15600 – 39100/- With 6600/- Grade Pay . All Eligible and Interested applicants may fill the net utility via professional website http://www.Ndmc.Gov.In before or on twentieth April 2018. North Delhi Municipal Corporation Recruitment 2018: North Delhi Municipal Corporation has invited on-line NDMC Recruitment 2018 application form the eligible and dynamic candidates for filling of 77 Junior, Senior Resident in Hindu Rao Hospital on everyday foundation. Aspirants can download NDMC Vacancy 2018 Application Form via the reputable website @ mcdonline.Gov.In. You have to take part in the NDMC Residents Jobs 2018 stroll-in interview on date 08th January 2018 at beneath given deal with with stuffed shape and documents. Moreover, the alternative info for NDMC Vacancy 2018 along with a way to practice, choice process, and so forth., are given underneath. The North Delhi Municipal Corporation has invited the aspirants to fill the vacant seats of Jr., SR. Residents posts. Candidates who've scientific degree the ones can participate in NDMC Recruitment 2018 walk-in interview on date 08th January in conjunction with the filled application and original documents. This is the modern day vacancy for aspirants who're seeking for Jobs in new Delhi. Candidates are recommended to examine the complete details and take part in stroll in interview on time. About NDMC: The Municipal Corporation of Delhi is an self sustaining body inside the state of Delhi, India. The municipal enterprise includes an area of 1,397.3 km². It is liable for fulfill vacant posts within the diverse departments in step with need. It recruits the aspirants by means of written examination and interview spherical as in step with requirement. 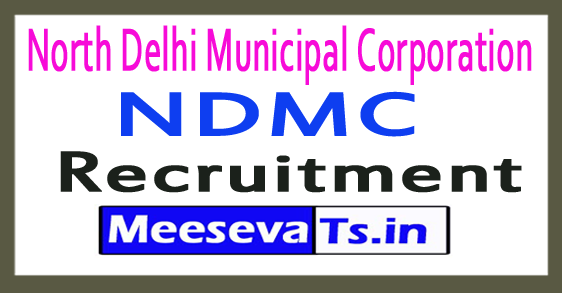 North Delhi Municipal Corporation has uploaded an NDMC Jobs Notification 2018 at their respectable internet site to rent seventy seven applicants for Junior/ Senior Resident Posts. Aspirants who've been meet the eligibility details can participate inside the interview spherical. So you want to be ready with the stuffed shape and authentic important files. Firstly, log on to the legit website mcdonline.Gov.In recruitment 2018. Check for the NMDC activity notification & down load it. Read the notification and fill utility by means of correct information. Paste current photo and make sign. Recheck it and convey at the interview time with files. Selection of applicants may be based on the written check and Interview carried out through the North Delhi Municipal Corporation. So aspirants have to participate in walk in interview on time and get suitable marks. The final merit list could be prepared with the aid of the performance in Selection Process. The NDMC Result 2018 can be declared on the authentic internet site very quickly. Candidates who will take part in walk in interview will capable of recognise the benefit list name at their legitimate portal. You can live with us on SarkariResuslt24.In for upcoming Sarkari Results. Finally, we are again informing the candidates to examine the legit notification before making use of for the NDMC Recruitment 2018. Interested candidates can take part stroll in interview on 08th January 2018 at the side of the stuffed application form.